Can we live with less plastic bottles? Can we invent a new future without all of this? What you see in this image is the average day production of a medium size business building, in one of our cities. Estimates say around 2.500/3.000 bottles sold every day to satisfy people drinking needs. And this is only a drop in the ocean of plastic produced and wasted every single day of our actual life. Just to give a glance of the impact, the average lifespan of a plastic bottle is from 300 to 500 years. Download this fantastic poster to learn more about The most dangerous species of our coasts and lagoons. Today is the World Environment Day 2009, so what better day to think a bit about this issue and look for some solutions? 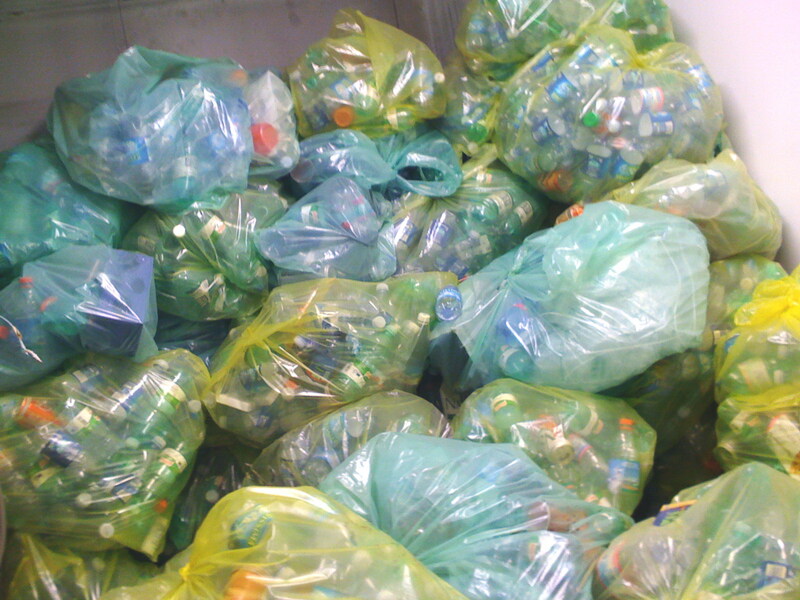 Categories: events, ideas, visions | Tags: bottles, environment, plastic, pollution, sustainability, UN, UNEP, United Nations, WED, World Environment Day 2009 | Permalink. CHANGE seems to be the KEY word all over the world these days. 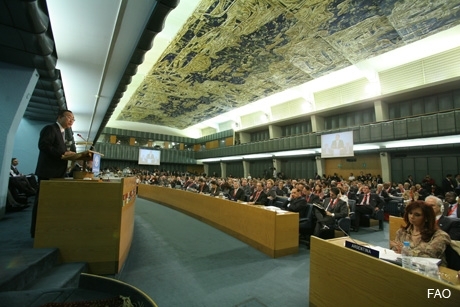 At FAO, two main events just took place last week. The Organization is undertaking a deep and serious process of internal restructuring. After the IEE (Independent External Evaluation) report, which suggested many and different changes in the strategy, the approach and the structure, now it is time for implementation. It will officially start after the approval of the action plan by the member states, late this November. As you can see in the picture, all of us were invited to attend a presentation meeting organized by the Senior management to illustrate the guidelines of the FAO Reform. At the same time, in parallel and due to this process, a new ad-hoc tool to promote change has been created in the house: the “Culture Change Team” is in charge of taking care of this change-of-mentality process. The first public appearance was the convocation of a voluntary gathering called Open House session, which I attended last Tuesday. The meeting was very informal and easy, with a short introduction of the Team, which is composed by 15 people, both from headquarters and Regional offices. Second step consisted in an invitation to comment and complement in a proactive way the draft list of vision statements prepared by the Team. Lastly, a longer World Cafe session allowed people to gather in small groups of 5/6 persons to discuss for some 25 minutes how we would like the culture of FAO to be. Each group’s final report was publicly illustrated to the assembly. In the meanwhile, the issues of change, reform and new culture are being addressed more and more also in the web Forum on the Intranet which is, I think, a good sign of commitment and willingness by people involved in the process. Still, scepticism persists. It is clear and widespread. The question “Is this the real time for change?” came clearly out during the presentation meeting. Again TRUST came out to be the fundamental factor upon which collaboration is built. If people do not trust the leaders, than their actions, whatever they are, will be unlikely to be successful. In this regard, I can say that many colleagues, not “trusting” this trend, choose not to join the presentation meeting which had been organized by the Senior management to illustrate the guidelines of the FAO Reform. To me, this need of reorganization is deeply connected to a wider change the entire world faced in the last decades, where two key factors mainly changed: transportation and communication. In my vision, in a world where space and time ceased to be strong barriers, an international organization committed to eradicate hunger and poverty in the framework of the United Nations, as FAO is, and which is fundamentally based on knowledge to achieve its goals, has to find in the worldwide scenario a completely different role from the past. In my opinion, it has to move from “supporting” Governments in the management of development activities, to “facilitating” the interaction between Governments and local/regional/international actors to work jointly on development projects. In a nutshell, in the future I see FAO as a facilitator of processes, at local level, and as a supervisor for strategies, at regional and international level. As a consequence, the range of activities, skills, tools, methodologies and even type of knowledge the organization has to use have necessarily to change considerably in the near future. Categories: events, ideas, reports, visions | Tags: change, communication, cultural change, development, facilitation, FAO, future, interaction, needs, people, perspective, process, roles, scepticism, trust, United Nations, world cafe | Permalink. 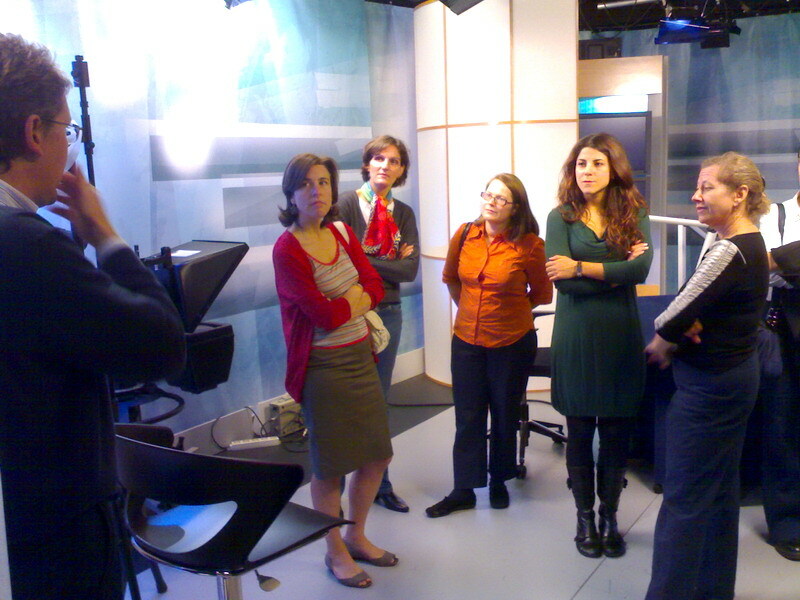 Some days ago a group of communicators working for different services of FAO had a very interesting visit to the radio and video studio of the organization. Ten of us, part of the “bluebar” communicators list, spent the morning with the responsible for the infrastructure debating on: how to use the facility, the recent and past products of the studio (the production is accessible online via the audio, video and webcasting pages), the FAO communication policy and other issues related to our jobs. it became a source of ideas and will to create new initiatives inside the house (something that’s crucial in these days, while waiting for the organization’s restructure and in the light of the activities of the “Culture Change team“). Categories: reports | Tags: collaboration, communication, communicators, examples, facilities, FAO, interaction, knowledge sharing, professionals, trust, United Nations | Permalink. A nice briefing session started today the “public” activities of the Share Fair 2009 that the Rome based UN organizations (FAO, IFAD, WFP, CGIAR, ICT-KM Program and Bioversity International) are preparing for late January 2009. Gauri and Steve introduced the event, the basic principles and the collaborative spirit that are behind it. Now all departments and divisions of FAO and the other organizations are really welcome to propose topics for discussions and question to be treated in the open spaces which will take place for three days. One intervention focused on the importance of exchanging the “common good sense” many of us use daily to solve problems. This is a crucial point to me: it can help people to understand the deep value of their “common good sense”, with a potential multiplier effect on the awareness of the important of their experience and capacity of doing things. The Call for proposal document is ready to be downloaded to present these ideas before October 31st. Categories: events, news | Tags: awareness, bioversity, blogging, capacity building, CGIAR, common good sense, facilitation, fair, FAO, IFAD, km, km4dev, knowledge management, knowledge sharing, preparation, Rome, Share Fair 2009, United Nations, value, WFP | Permalink. FAO is doing a huge effort to produce and distribute a long list of content about the actual High-Level Conference on World Food Security: the Challenges of Climate Change and Bioenergy. The website is a good channel to be virtually and ideally in touch with the event: the video, the pictures, the speeches and other material are available live on the dedicated website. Information is overall seriously taken in consideration. Not the same I can say for communication. My consideration is that, still, this material is not “web 2.0 oriented”. FAO talks but what is the attention for those who are listening to? Where is the intention to share? Well, I actually have the habit to do something more than that to blog about something. What about your habits? Do you feel this up-to-date or a bit old-styled? Categories: events, social media | Tags: bioenergy, climate change, communication, conference, development, events, FAO, FAO hlc, food security, km4dev, knowledge management, knowledge sharing, lessons learned, Rome, United Nations, web | Permalink. 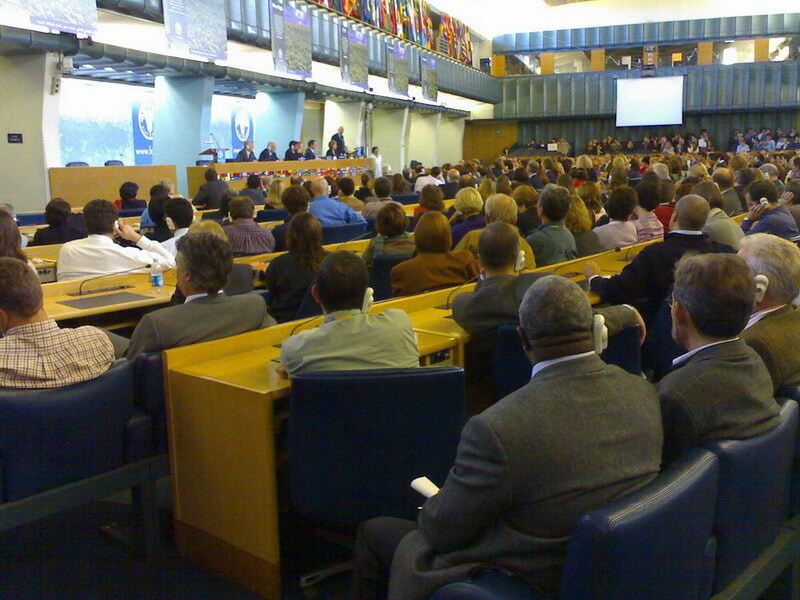 These weeks I’ll be pretty busy with this new temporary job as Liaison officer with media broadcasters at FAO during the High-Level Conference on World Food Security that will take place in Rome from 3 to 5 June 2008. I’m very interested in knowing more about the media/TV business and the way it works during such big and worldwide events. I’ll post later on if I find interesting hints for our KM activities. Have a look at the Live video coverage (streaming) and listen to the Audio coverage of the summit (mp3). Categories: events, social media | Tags: communication, development, events, FAO, United Nations | Permalink.